"A really good groove box, so easy to get beats and hooks going in moments and the sound is just stunning!" "Well this is something special I can tell you, so much has gone into this and many people are going to just love this"
"Lots of preinstalled sounds, effects and the usability is there. 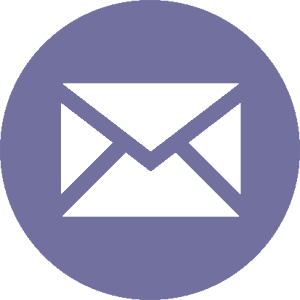 It allows you to be as creative as you like with no need for the numerous sub-menus you find on other software"
"This is a very well thought out and inspirational app. It goes much further than just electronic dance music... Highly recommended!" "Where has this been my whole life!... 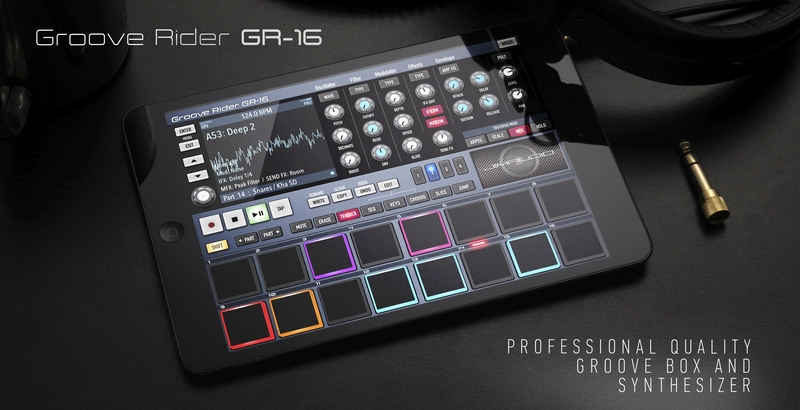 Gorgeous, user friendly, simple and sonically vibrant"
Introducing Groove Rider GR-16: a professional groove box, inspired by professional hardware drum machines and rhythm boxes. It has a powerful Poison-202 based two oscillator synthesizer engine, plus a big variety of included PCM drum samples, insert / send / master effects, arpeggiator, automation recording, modulator, ADSR, filter and more! Built-in factory pattern library includes patterns in different music styles, which will inspire you (the list will be appended with the regular updates). Check out the patterns demo video. The most remarkable feature of GR-16 is that all the controls are arranged on one screen, just like on a real groove box device. It lets you access almost all useful parameters from the one screen. Forget about numerous sub-windows and dialogs, which ruined your inspiration in another musical apps! 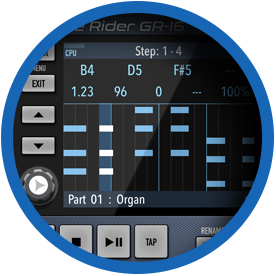 GR-16 synthesizer module is built on a Poison-202 sound engine, well known synthesizer app from JimAudio, which gained a lot of good reviews and attention in the iOS musical world last year! 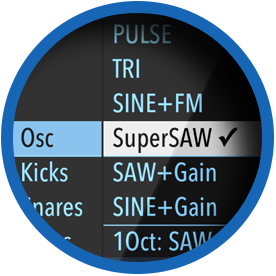 It provides 83 combinations of oscillator setup and sounds very rich and fat! Assign LFO modulator of 9 types (EG Up/Down, LFO, LFO BPM, Saw Up/Down, Square Up/Down, SampleHold) on each part to any of the 6 destinations: Filter, Pitch, Level, Pan, Oscillator parameter or IFX parameter, and get 54 modulation combinations in total! Here you set up the sound source for currently selected part. A source can be either a synthesizer engine generated sound, or a PCM sample, internal or external (imported by user). Control oscillator's Pitch and special Edit 1 and 2 parameters (depends on oscillator or sample type you choose). Pass generated oscillator sound through the part filter block. 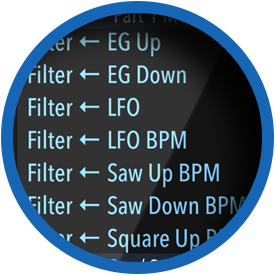 Select from Low Pass, Band Pass, High Pass, Peaking filter or Notch. There are 2-pole and 4-pole versions of each filter, as well as simple filters and soft-clipped filters with more smooth and compressed sound in high resonance range. Select from 9 types of modulation waveform per part: EG Up/Down, Triangle LFO, LFO BPM-synched, Saw Up/Down, Square Up/Down and Sample&Hold. Assign part's modulator to control one of 6 destinations: Filter, Pitch, Level, Pan, Oscillator parameter or Insert FX parameter. 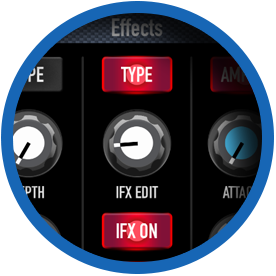 Select one of 34 available insert effects per part and adjust it's parameter by turning IFX Edit knob. Add send effect with Send FX knob. Choose to pass or not this part's sound through the MFX. Adjust the ADSR envelope generator. ADSR can be fed either to the part's amplifier envelope (by turning on the AMP EG button), or/and to the Filter Cutoff, by adjusting Filter's Env knob. These four buttons allow you to select, what to control with the XY-touchpad (the JimAudio logo field below). You can activate the Arpeggiator/Gate (Arpeg button is led), Scale play mode (Scale button led), Scale play with arpeggiator (Arpeg and Scale buttons led), or choose MFX control mode (MFX button led). Hold button allows you to latch desired MFX state. Mixer page is especially made to give user the ability to control levels of all 16 parts simultaneously from one page. You can also adjust Pan of each part, as well as Send FX amount. There are also Mute and Solo buttons for each part. Adjust Pattern's master and Send effect's volume from the Mixer page. Switch on or off the master Limiter. Control your sound by using level meters per each part and for the master output. In the main control panel you can see a four transport buttons: Record, Stop, Play/Pause and Tap, which control the playback and recording of the groove box and allow to adjust the Tempo. Next to them you can see the main edit buttons: Write, Copy, Undo and Edit. If you hold the Shift button while tapping Write, Copy or Undo button, you invoke the Rename, Clear and Redo commands correspondingly. Two Part select buttons allow quick selecting of previous or next part. Eight buttons next to them are pad mode select buttons. They determine, what drum pads are responsible for, in the 8 corresponding pad modes: Mute, Erase, Trigger, Seq, Keys, Chords, Slice and Jump. These four buttons marked 1, 2, 3 and 4, are responsible for selecting current Bar in the step sequencer (Seq) mode, or selecting of keyboard octave for Keys, Chords and Slice pad mode. Blue led on them indicates curently playing bar cursor, while red led indicates currently selected bar or octave. 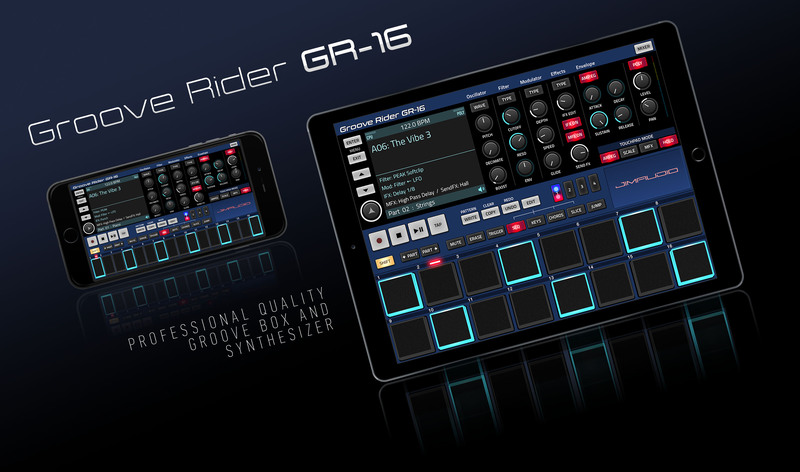 Groove Rider GR-16 for iOS is a standalone app. 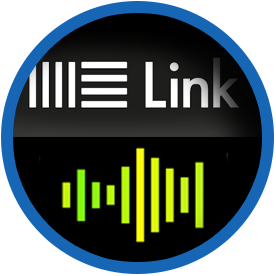 It is compatible with Audiobus, Ableton Link, and can also be used as Inter-App Audio (IAA) generator for audio data output. Groove Rider is compatible with iOS 9.0 and higher. Minimal recommended devices: iPhone 5 and iPad Air. Optimal recommended devices: iPhone 6 and iPad Air 2. 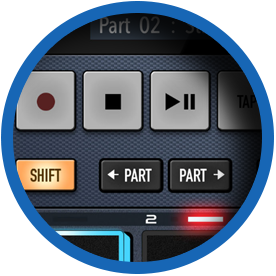 Choose from 34 Insert Effect types per each part, 12 types of Send Effects and 22 types of Master Effects! Use Reverb, Chorus, Flangers, Phasers, Mono and Stereo Delays, Filters, Distortions, Decimators, Vinyl Break, Slicers - everything you can imagine! 16 parts per pattern with assignable Insert Effects. 32 voices polyphony. 64 note step sequencer with parameter automation. More than 500 one-shot samples and 27 PCM instruments to choose from. Created for performing live. Use Groove Rider in sync with another apps and devices, which support Ableton Link easily! Route through Audiobus or any other Inter-App Audio host!